The New 70 Grain BlitzKing Factory Load from SRC Arms. 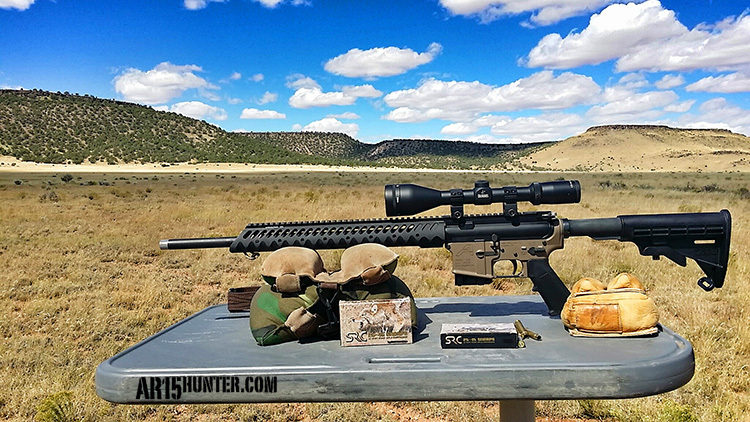 A year ago, AR15 Hunter released our full review, with a range and hunt report, on the .25-45 Sharps cartridge. For those who need a refresher on the .25-45 Sharps, this is a .223/5.56 cartridge that is necked UP to accept .257 diameter bullets. 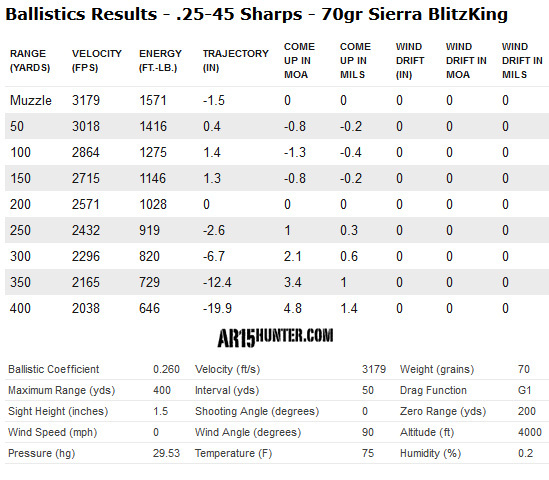 The Sharps Rifle Company released their initial factory load with the 87 grain Speer Hot-Cor bullet, at a listed 3000 feet per second (fps). Although the 87 grain load is a great round for medium sized game, and can be used on varmints, my hope was to see a true varmint type bullet at some point in the near future. When we spoke with the Sharps Rifle Company (SRC Arms) at the 2015 SHOT Show, they mentioned that they were working on a factory varmint offering, so as I began to schedule my fall varmint hunting trips, I spoke with SRC Arms to see what stage they were at with the development of the new, aforementioned, varmint load. I was pleasantly surprised to hear that it was at the end of the development phase, and they had some of their new factory varmint ammunition that they could send me for testing out in the field! This new varmint factory ammunition from SRC Arms is loaded with a Sierra 70 grain BlitzKing bullet, which is a true “varmint” bullet. The bullet itself is described by Sierra Bullets as “designed for explosive expansion in varmints and small game and with accuracy characteristic of the MatchKing bullets. The tips of these bullets are made of a proprietary compound, and the jackets are thin for enhanced accuracy and explosive expansion.” In layman’s terms, that means these bullets are accurate and blow-up varmints! With our chronograph results averaging 3179fps (20 inch AR15 barrel), this gives the 70 grain bullet an approximate ballistics coefficient of .260. Plugging those numbers into a ballistic calculator, puts this bullet only 6.7 inches low at 300 yards, with a 200 yard zero! At that 300 yard distance, the bullet is still traveling at 2145fps, with 715 foot pounds of energy (fpe) remaining. For varmint hunters, the retained fpe means reaching out past 300 yards to knock down a coyote sized animal, is feasible with proper shot placement. 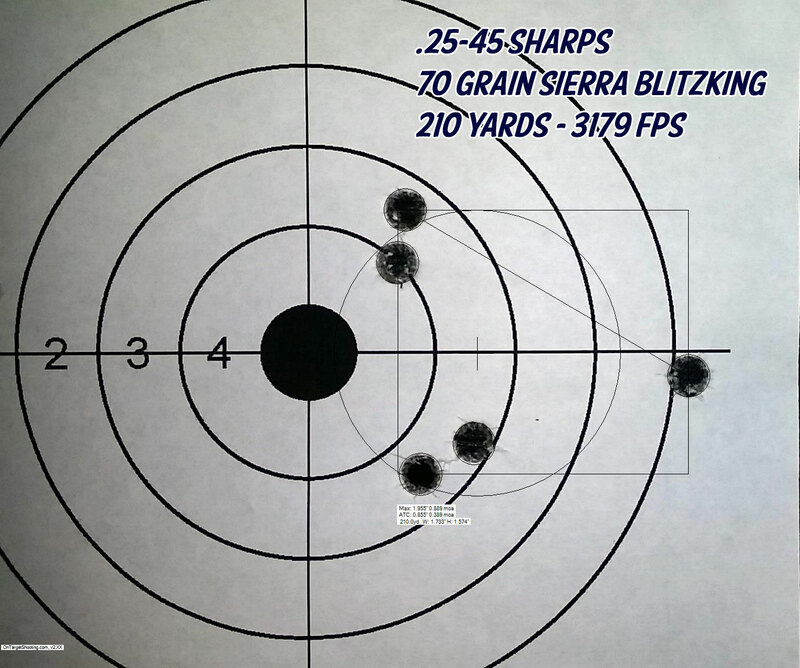 The accuracy portion of Sierra’s bullet description held true while sighting-in, with my initial groups at 100 yards averaging right around 1.25″. 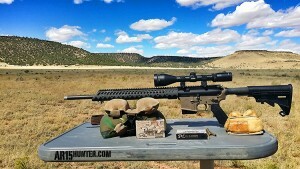 Before I finished at my range (the open desert), I moved my target out at 210 yards to do some longer range shooting before heading out on my prairie dog hunt. My group at 210 yards averaged 1.955″, which works out to a 0.889 moa. After shooting a some targets the 210 yard mark, and having good results, I was feeling confident that these rounds were going to put the hurt on some marauding prairie dogs! The Performance at 200+ yards was impressive! When we arrived at the cattle ranch for our hunt, we were met with a strong wind from the south and lots of prairie dogs. My plan was to begin shooting a couple of close targets, in the 125-135 yard range, then start looking for prairie dogs that were out past 200 yards, for some longer shots. I had one pop-up at 126 yards, so I aimed for the back of its head when stood up, and squeezed the CMC 2-Stage trigger. 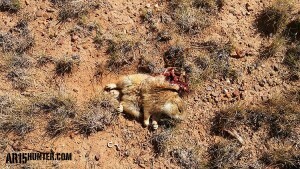 When the bullet hit, I saw parts of the prairie dog’s head, and the bush behind it, blow in every direction. So far, so good. A few minutes later, another appeared in the same area, my first shot just missed it (I blame the wind), but my AR15 offered a quick follow-up shot, and this time the bullet hit it head on and blew it apart, resulting in an instant death to the prairie dog. After hitting a few more in the 125 to 150 yard range, I started glassing farther out. I spotted a few prairie dogs on a slight downward slope, in an area with fairly sparse vegetation. I hit the closest one with my rangefinder, and got a reading of 191 yards. I found it in my scope, and aimed slightly right to compensate for the wind. My first shot hit exactly where I aimed, so as the prairie dog hunched down, I held right on it and killed him. While shooting at the one at 191 yards, I noticed another standing on a mound about 40 yards past it. I quickly found it in my crosshairs, held along the right side of its body (wind was blowing from right to left – see video), and blew him up with my first shot. The performance of this new factory cartridge/bullet at the 200 to 230 yard range was impressive! 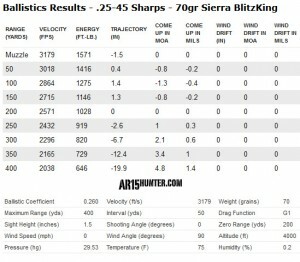 The 70 Grain BlitzKing Performance was Evident. I ended up taking a few more prairie dogs, and the more I shot, the more I appreciated this new load. It was accurate, and the bullet performed well. After the prairie dog hunt, we had a cold front move into the area during the last two days of our hunt. Instead of giving up on varmint hunting, we switched over to coyote calling. Unfortunately, the cold front also came with 25 to 35 mph winds. Although we made some stands, no coyotes showed, so I was not able to drop any with this new load. 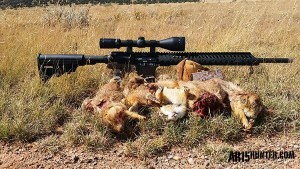 A Handful of Prairie Dogs Taken with the .25-45 Sharps. The beauty of the .25-45 Sharps cartridge was evident a week after I returned from the hunt. I had a deer hunt coming up, and planned to use the SRC Arms 87 grain Hot-Cor factory round for my hunt. While sighting-in for the 70 grain factory load, I kept notes on where I needed to adjust my scope back to the 87 grain load. Once I did so, I shot 3 rounds to verify my zero, and was able to go after Mule Deer. Unfortunately, my hunt was unsuccessful, due to unseasonably warm weather and lack of legal deer to shoot. Now that deer season is over, I plan to get back to predator hunting, so I adjusted my scope back to the 70 grain load, and I will verify before my hunt. Lastly, the option to just use factory rounds is very appealing to me right now, due to my very busy schedule. Saving the time I would have needed for load development, gives me more time to hunt. SRC Arms listened to their customers, and expanded the .25-45 Sharps’ versatility with this new 70 grain factory “varmint” offering. Over the course of a few days, I was able to take dozens of prairie dogs with it, from 125 yards, to well beyond 200 yards. The new round shot very flat for a quarter-bore, and the 70 grain Sierra BlitzKing bullet proved to be devastating on prairie dogs. 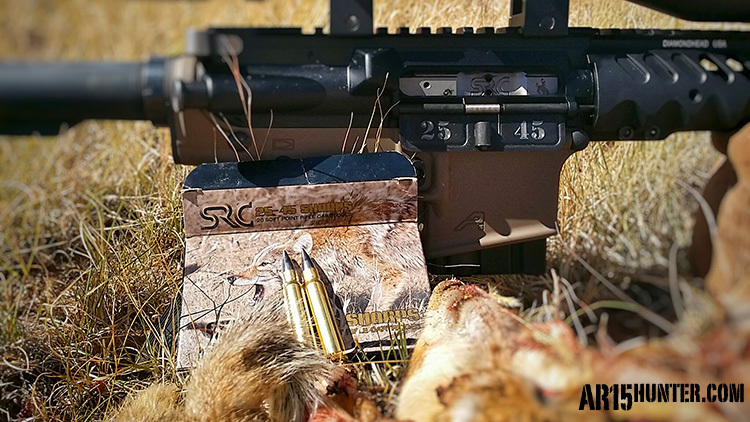 With this new load, in addition to SRC’s 87 grain load, the .25-45 Sharps can be used on medium sized game, such as deer and wild boar, as well as varmint and predators. Include an accurate AR15 upper, and you have a single-cartridge that can be used in a rifle you are familiar with, year-round! Cold weather is finally reaching us here in California, so I will be out hunting predators with the new ammunition very soon. Keep an eye on our Instagram, or Facebook page, for updates! I am a 51 year old die-hard hunter located in SW Idaho, who has been hunting since age 13.I have hunted in almost every county in California, as well as in Idaho, Wyoming, Nevada, Texas, New Mexico, Arizona, Oregon, Washington and even parts of Canada!